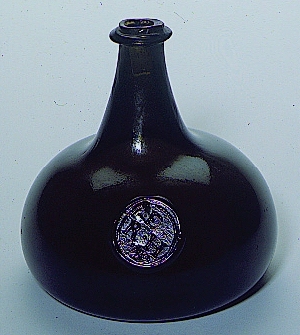 The term black glass mainly refers to very dark English bottles from about 1690 to the 1850. 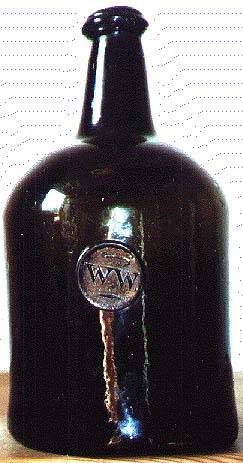 Black glass bottles are usually not acutally black, but the colors (ranging from dark brown to olive-green) become visible when the bottle is held against the light. One reason for the production of black glass was that it protected the contents of the bottle against the harmful effects of light. 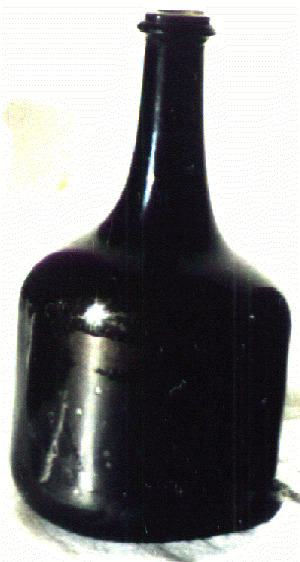 From the late 1600s to the mid 1800s, the majority of English bottles were made of black glass. The most typical bottles from that period were onions (ca. 1690-1730), mallets (ca. 1730-1770), squat cylinders and cylinders (from about 1770). 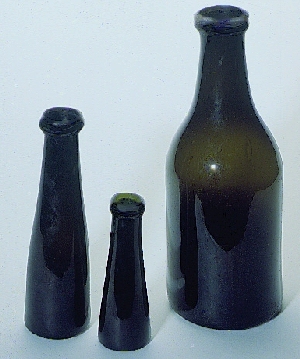 The English melting technology, based on the use of coal, was later introduced in the United States and in continental Europe, and also resulted in almost black bottles. Above info/photos provided courtesy of R. Kosler and N. Kleindienst. Also see Gin Bottles for case gin bottles made of black glass. Ask a Question about Black Glass Bottles. Flasche Bottle und Bouteille is a German book with English translation that has many fine examples of black glass bottles with their history and photos. Search all ebay categories for Black Glass.